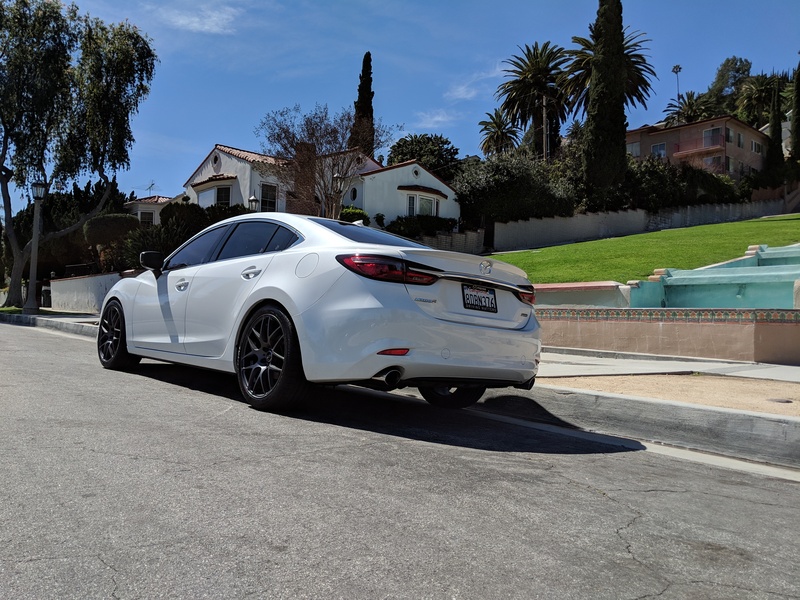 Mazda 6 Forums : Mazda 6 Forum / Mazda Atenza Forum > Mazda6 (Atenza) > Mazda6 (Atenza) > 3rd-Gen > Finally took the plunge and upgraded my wheels and tires. Finally took the plunge and upgraded my wheels and tires. 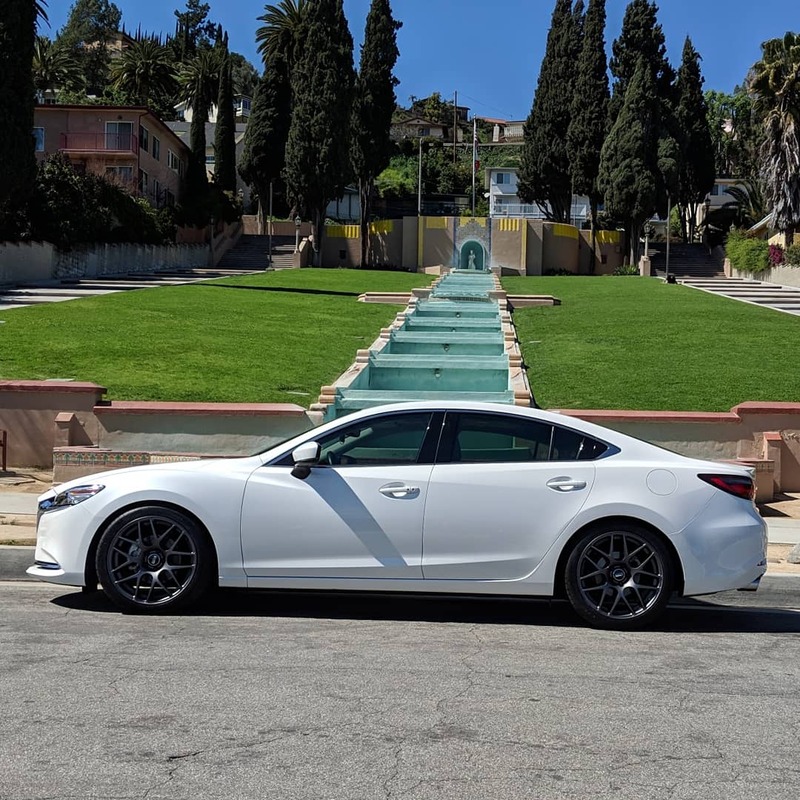 It took me awhile but since I wore my front tires down after just 11,000 miles after being a bit aggressive on all the twisty bits, I broke down and picked up a new set of wheels and tires. To those who were extolling the virtues of upgrading the tires, I can totally understand now. The difference was immediately noticeable. Especially with turn-in. Even with low speed maneuvers like a sharp right turn, the response is much quicker and I find myself turning the wheel too much sometimes. The lightweight wheels made a significant difference not only in acceleration but also in braking. I'm still not quite used to how quickly this car stops in comparison to the distance it required with the stock wheels and tires. I end up stopping a bit short each time. 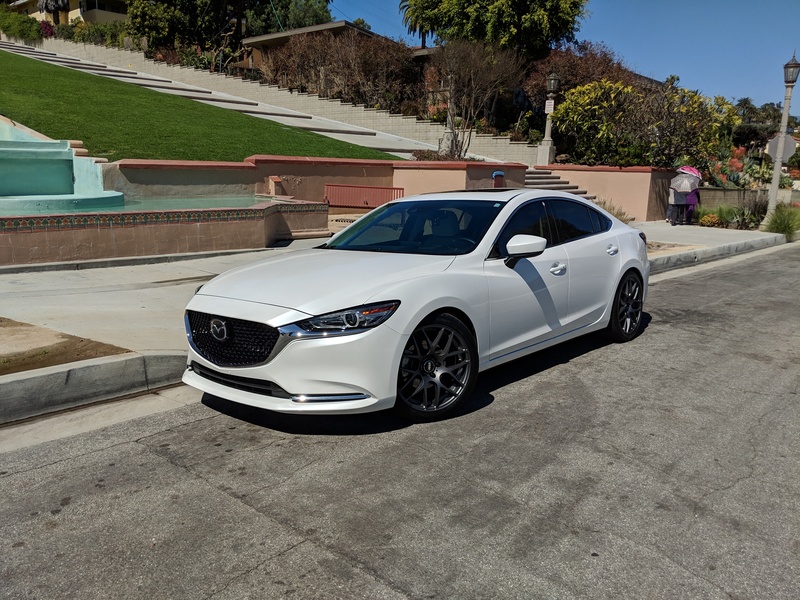 Just to give you an idea, I weighed both the oem and the VMR wheels with tires. 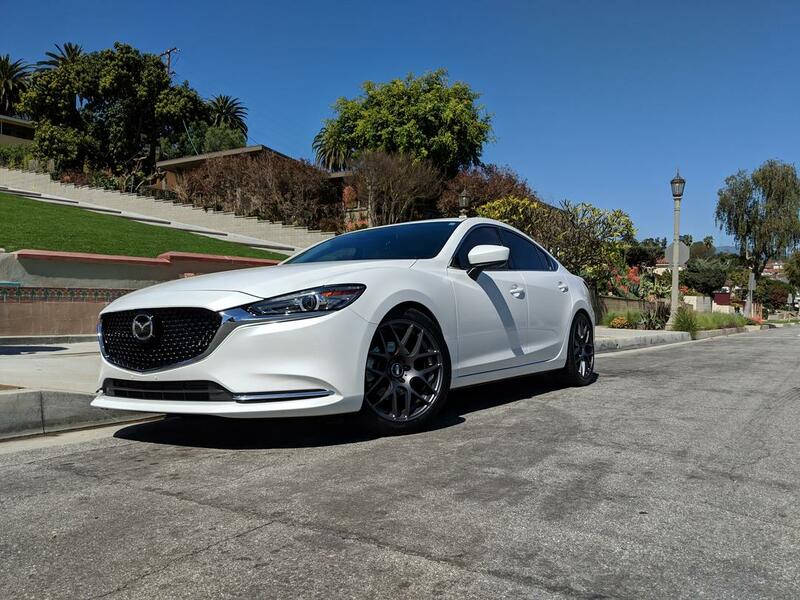 The oem wheel/tire combo was between 54-55 lbs each, the VMR wheel with the wider tires weighed in at 47-48 lbs each. That's a significant reduction of 6+ lbs of unsprung weight in each wheel. I'm quite happy with the results. Not too many people run my setup so I was a bit anxious about it, but definitely stay at 245 wide or below if you plan to run a +35mm offset, the front wheel is completely flush with the fender. Anything wider and you will rub. Thankfully, there's no rubbing for me, even during hard cornering. Trippp, idrive, 93blkongreenpro and 1 others like this. Is the car lowered at all? It looks real good. I've been looking for new wheels since I bought my 6 a month or two ago. Not only are the stock ones, well, stock but they're also badly curbed. They remind me of my nurbies - love them! Wow, those turned out great. Car looks and sits perfect IMO. What tire did you go with? It's lowered 1" all around on Tanabe springs. It looks fantastic. I've been considering lowering mine about an inch as well. After seeing this, I might have to just bite the bullet and do it. Careful - He's in Cali and you're in MA - entirely different worlds of driving needs lol. I debated going lower and 1" was my absolute max. Then I drove around a bit more and realized it would be silly on these roads. Hmm good point. I've got a friend with a CX5 who's pushing me to get the same Eibach lowering springs he's running to take it down about an inch. I'll have to do some more thinking. I drove my first gen 3 for about a year and while it wasn't lowered, it was a whole lot lower than the 6 and speed bumps were... problematic. I like the look of the lowered 6 a lot but there's always that balance of what you want vs. what's practical.